Managers in the public and private sectors lack the skills to recognise the symptoms of trauma in their staff, says PTSD Resolution. The charity for the mental welfare of veterans of the UK armed forces is now organising a workshop for line managers and HR (Human Relations) professionals: TATE, Trauma Awareness Training for Employers is on February 23rd 2015, in London. Between 50 and 60 percent of the general population experience ‘life-changing’ trauma. The one-day event helps managers to identify symptoms of PTSD (Post Traumatic Stress Disorder) in their staff and then guide them to seek professional treatment. Resolution is a UK charity (No. 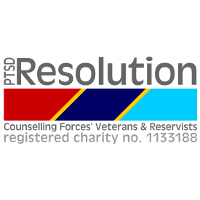 1133188) that offers free counselling to UK armed forces veterans and reservists suffering from trauma. It also provides guidance to organisations to help employers meet statutory obligations in supporting staff who may have related mental health issues, to avoid the personal and commercial impact of trauma. PTSD can result from military service by forces’ veterans the charity says, with symptoms becoming apparent only many years later as a result of domestic or work pressures for example.